The thought of a relaxing dip in the pool becomes less appealing when you think about all the chemicals in your pool water. Fortunately, there are natural alternatives to the sanitation chemicals typically used to keep pool water clean and sanitary. You also can take steps to reduce the amount of dirt and debris that find their way into your pool. Placing plants near your pool enhances your landscape and keeps your pool cleaner. Green, leafy plants give off oxygen, and oxygen in pool water helps promote and support good bacteria. These good bacteria feed on algae and other organic materials in your pool. Encouraging these good bacteria is as simple as placing plants close to the edge of your pool. If you're feeling adventurous, turn a section of your pool into a natural water garden, placing plants directly in the water. This type of natural pool is quite common in Europe; it creates a living filtration and oxygenation system. If you have a saltwater pool, remember to choose plants that enjoy brackish water. Hydrogen peroxide (H2O2) is a natural alternative to chlorine for sanitizing your pool. Hydrogen peroxide is a combination of hydrogen and oxygen that's often used as an antiseptic and disinfectant. That little brown bottle in your medicine cabinet is probably only 3 percent hydrogen peroxide. For pool cleaning, you'll need a 35 percent solution, which you can purchase at natural food stores, pool supply centers or online. Add a cup of hydrogen peroxide to your pool for every 100 gallons of water. 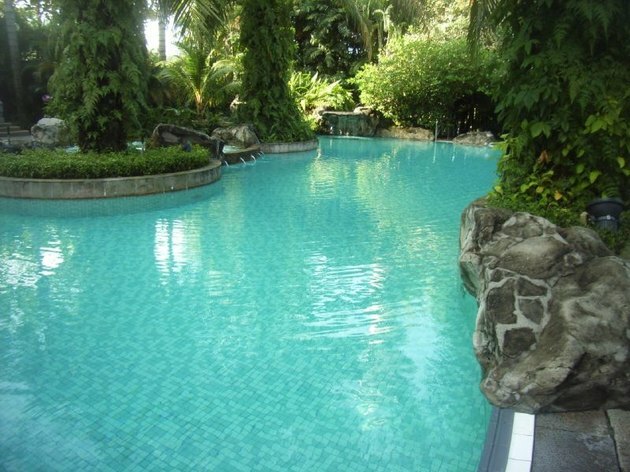 To maintain your pool, you also need to regulate the pH of the water. If it goes too high, pool sanitizers function poorly. 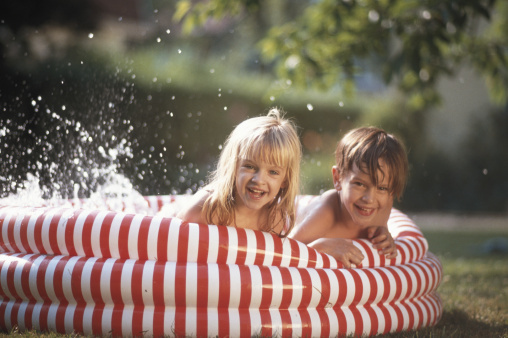 If it goes too low, the pool's pipes will corrode, and swimmers may experience eye irritation. If your pH level is too high, add baking soda to the pool. Add 1 1/2 pounds of baking soda per 10,000 gallons of water. If the pool's pH is too low, add 1/2 cup of borax for every 10,000 gallons of water. Borax, which is made of a natural mineral, is found in the laundry aisle of most grocery stores. A quick shower before getting in your pool will help keep things clean. One simple and natural way to keep your pool cleaner is to shower before getting in it. When you go for a swim, your body leaves some of its natural oils behind in the pool water. Showering before jumping in the pool removes some of these oils, so fewer of them can deposit in your pool water. It also removes any oils from any perfume, after-shave, moisturizers or hair products you use. Even if you shower before getting into your pool, you'll still leave behind some of your body's natural oils. You also may have to wear sunscreen in the pool to protect your skin. To mop up these oils, throw a few tennis balls into the pool and let them float around. Their outer felt covering will absorb oils over time, pulling them out of the pool water. When the balls start to look dirty, replace them. Robotic pool cleaners help keep natural pools as clean as those treated with chemicals. Admittedly, a robotic pool cleaner isn't a natural way to clean your pool, but it may be an important step. At the end of the day, homeowners use chemicals to clean their pools because they work well. Natural remedies don't always work quite as efficiently, especially after a big pool party or heavy pool usage. A robot will automatically clean the pool for you as often as necessary, saving you time and labor. Robots decrease the amount of debris that runs into the pool filter and help keep pools sparkling clean.